Millz House is your one-stop shop for all things sports and recreation at the best price! From indoor and outdoor basketball courts, basketball hoops, tennis courts, ice rinks, play systems, trampolines, ping pong tables, to even premier garage floor coatings! Message us today for a free quote. TRY IT! LOVE IT! BUY IT! Here at Millz House, you will get the attention to detail and customer care you won't get elsewhere. You can always be sure we will treat you with respect and honesty from the start. We are and continue to be a family owned company. From our family to yours, we want to help your family make the best choice. HISTORY: Alan and Katie Mills are the owners. Alan started the business in 2000 as American Garage Solutions installing floor coatings, while Katie stayed home to raise their two boys. American Garage Solutions, or AGS as we like to call it, really took off! Turns out doing a fantastic job for people really pays off. Because of this, AGS has been and continues to be a leader in the floor coating industry. In 2005, Alan decided to expand the business and added SnapSports Minnesota to his repertoire of business ventures. SnapSports Minnesota specializes in indoor and outdoor game courts. With Minnesotans being so involved in sports and wanting the best for their kids, SnapSports Minnesota fired up. In 2009, with the 2 businesses growing and the kids getting older, Katie joined her husband and they now work together as a team. 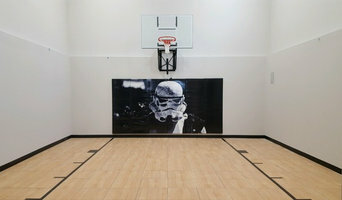 To date, the company has installed over 1,500 game courts. Today the business is located in a 12, 000 S.F. showroom in Apple Valley where customers can try out the SnapSports game courts, Playground One play systems, Vuly trampolines, Cornilleau table tennis, Spalding portable basketball hoops, and other items too! There is only ONE, Sport Court! Minnesota and Wisconsin's largest Sports Construction company. 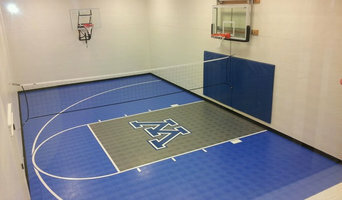 From the small backyard basketball court to the full size Tennis Court, Home Gymnasium too! We are the most experienced team in the area. For 27 years we have been under the same ownership and our youngest sales professional has been with the firm for 18 years! History: Sport Court® has lead the way in performance sports products since 1974. Today, we are the number one manufacturer of modular sports flooring across the country and around the world. 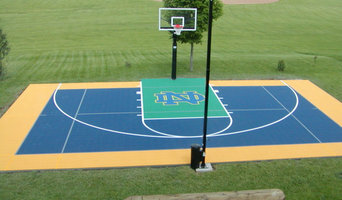 Sport Court athletic surfaces is the choice of the world's leading athletic organizations. With over 50,000 installations, we are the worlds' largest court and sport surface company. In Minnesota alone we have over 2,000 courts we have built, with that kind of referral list, you can rest assured you are buying from a company that has stood the test of time. Remember- "THE BITTERNESS OF POOR QUALITY REMAINS LONG AFTER THE SWEETNESS OF LOW PRICE IS GONE!" Products and Services: Sport Court can provide a safe place for kids and adults to play basketball, tennis, volleyball, roller hockey and more, whether it is in an athletic facility or in your own backyard. We also install an extensive line of professional putting greens and carry a line of golf training products. There is virtually nothing we cannot provide for you, if it is sports related, we have it! Check us out, you will be glad you did! D1 manufacturers hockey rink products including #HockeyBoards, #SyntheticIce and #IceRinkLiners. We are great at building dasher boards and synthetic ice rinks. 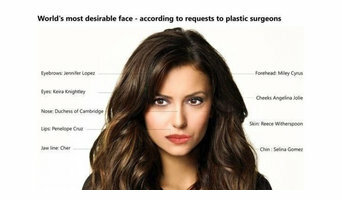 Daniel Q. Richardson MD is a Plastic Surgeon certified by the American Board of Plastic Surgery,a key credential indicating his level of training and commitment to ongoing education in his field. He has made the Mississippi Gulf Coast his home and has opened his doors to provide you with excellent care in plastic and reconstructive surgery since 1991. As a leading worldwide provider of innovative products including synthetic ice, hockey dasher boards, rink liners and accessories, D1 helps customers care for their backyard ice rinks, home synthetic ice rinks and commercial rink projects. We value the trust customers place in our people and products. Address: 11119 Mausel Street Eagle River AK 99577, USA Phone: 907-694-9200 Website: <a rel="nofollow" target="_blank" href="http://www.overthetoptents.com">http://www.overthetoptents.com</a> Are you having a party or hosting a large corporate event? For over 25 years, Over the Top Tents in Eagle River, has been Alaska’s top tent rental service. Number one in customer service and with the attitude and experience necessary to tackle any project, this talented team will help you realize your vision, from the casual to the fanciful. Over the Top Tents offers professional event tent rental for a number of occasions, including: Weddings: No matter the size of your guest list, Over the Top Tents offers wedding tent rentals to transform your wedding day dreams into reality. If you need location suggestions, the professional team will help find the perfect venue to accommodate all your guests. They will design the layout and placement of the tent for the best results, and they offer a preferred vendor list for photographers, DJs, caterers, and more. Corporate Events: Whether it’s a corporate banquet or an opening ceremony, Over the Top Tents manages corporate events of any size. Their event coordinators will work with you to create an event that matches your party’s unique vision. Let them handle the minor details, from supplying tables, chairs, and stages, to securing any special permits and safety fencing. Concerts Trade Shows: For larger events like trade shows or concerts, create a memorable experience with Over the Top Tents. From professional staging equipment to tables in a variety of sizes, their experienced team will get you the right equipment you need. Fast and reliable, they offer delivery and setup. Over the Top Tents provides a large selection of tents from pole tents to peak marquees to customized tents measured to your requirements. In addition to their beautiful tents, they offer a wide range of party accessories including tables, chairs, stages, and lights. With such attention to detail, let the professionals handle your next party or event. Whether you’re planning a wedding, corporate event, concert, or party, rent a tent from Over the Top Tents. Their experienced professionals will handle every detail with care, from event equipment to setup. As Anchorage’s top tent rental service, these event experts truly believe that the possibilities are endless. To learn more about their services, visit them online or call (907) 694-9200 to receive a free quote today. Address: 91-254 Olai St Kapolei HI 96707, USA Phone: 808-545-4599 Website: <a rel="nofollow" target="_blank" href="http://www.pcshi.com">http://www.pcshi.com</a> A Hawaii-state licensed contractor, Pacific Commercial Services strongly believes that the key to success is to provide great service to all of its customers. The company's motto is “good service is good business,” and the staff stands by this with every client. Located on the island of O’ahu, Pacific Commercial Services has been providing excellent environmental and construction services since 2001. Pacific Commercial Services specializes in all forms of hazardous, toxic, and radioactive waste management services, as well as special construction services and warehousing. These excavation contractors stand behind the work they do in all fields, and whether it’s waste recycling or solid waste management, no job is too big or too small for this company. Their list of customers includes: United States Military United States Department of Homeland Security United States Department of Agriculture Universities and Colleges Hawaii State Departments Refineries and Power Plants Commercial Businesses and Environmental Consultants Chemical Distributors and Government Prime Contractors These organizations and more come to Pacific Commercial Services because no one does a better job at contaminated site remediation and restoration, environmental construction, industrial marine cleaning, and military facility support. And with their dedication to reliable and responsive customer service, it’s no wonder that both the government and commercial businesses give their loyalty and trust to PCS. So when you need any form of environmental remediation services, be sure to trust the professionals that the government puts their faith in. Visit Pacific Commercial Services online or give the team a call at (808) 545-4599 today. vshred vin sant - What's going on guys! In todays video I'm gonna be going over 4 different types of diets and help you to figure out which one is right for your lifestyle! <a rel="nofollow" target="_blank" href="http://www.ryangaragedoors.com/">http://www.ryangaragedoors.com/</a> When considering garage door and opener service in Plymouth, MN, Ryan Garage Doors knows how to repair all of them. First and foremost, your Minnesota backyard court builder should have in-depth knowledge of sport rules, regulations and standards: court dimensions, net heights, lane widths and much more. If you’ll be teaching your friends, kids or others how to play, or if you plan to play on a competitive level, following national guidelines is important. Backyard court builders also keep tabs on the latest in athletics technology to provide you with the most updated options possible for your Eden Prairie, MN court. With your input, they’ll design a space that’s customized for your wish list and your home, then handle the construction. When the inevitable wear and tear starts to show, your Minnesota backyard court builder can repair, resurface or replace the aging elements. To ensure consistent quality and style, your backyard court contractor might also work closely with an Eden Prairie, MN general contractor, remodeling contractor or landscape professional. Here are some related professionals and vendors to complement the work of backyard courts: Outdoor Play Systems, Landscape Contractors, General Contractors. Narrow your search in the Professionals section of the website to Eden Prairie, MN backyard courts. You can also look through photos to find examples of Eden Prairie, MN courts that you like, then contact the contractor who worked on them.